Lentil falafels with lots of ground cumin baked in the oven: no oil-frying! Simple, fulfilling, gluten-free vegan recipe. Rinse and soak lentils overnight. Cook until smashy and let to cool. Put all ingredients, except cornmeal into a food processor and mix until smooth. Let it sit for approx. 30 minutes so the psyllium husk can soak up all extra moisture and the mixture won't stick to your hands. Take tablespoonfuls of the mixture, roll into a ball, roll in cornameal and put on a baking tray lined with parchment paper. Drizzle over with some oil spray. Bake at 180 C / 360 F in a convection oven for 10 minutes, switch to grill for another 5 minutes. Take out baking tray, flip over lentil falafels and grill for another 5 minutes to get a nice golden, crumbly texture. 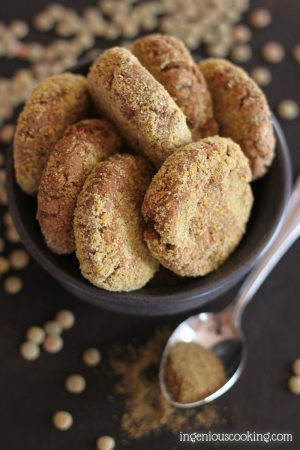 * Cornmeal is not a usual ingredient of falafel: it gives a nice crunchy, crumbly texture. In case you're allergic to corn, sub with brown rice meal.